The origin of this recipe is from Kerala and is traditionally eaten with Meat Curry similar to the Goan Xacuti Curry. 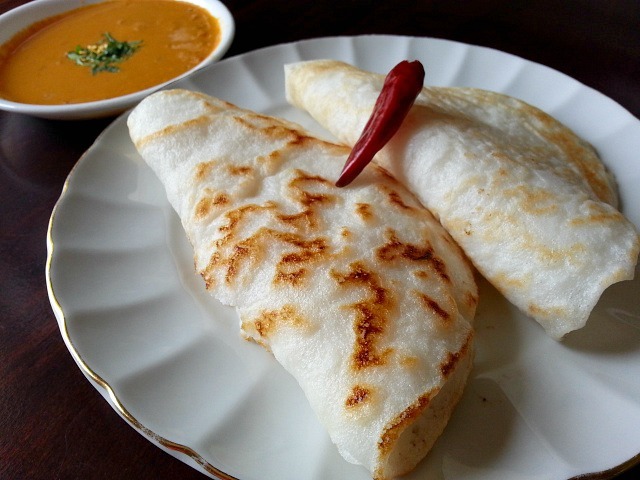 Making this recipe made me realize that it can be used to make the famous Goan Steamed Rice Cakes called Sanna (Sannam) with the addition of grated coconut to the batter specially when coconut toddy is not readily available. This will be my next project to make. It is gluten-free and kid friendly. As my mother in law is visiting us from Goa and she being from Kerala I have found some similarities between the Goan and Keralite cuisine. 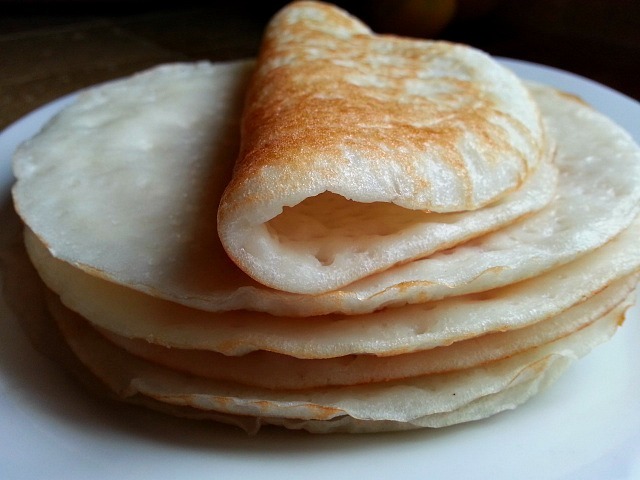 If you are a Keralite then probably you may judge me by the picture of my Appam or Rice Pancakes that it does not look like the real thing as Appam is made in a shallow wok and has a much lacy texture than mine. That is why I choose to name this recipe Rice Pancakes. My husband and I are constantly looking to replace our overload on gluten foods with alternatives and this is our new find for breakfast this week. I have been enjoying it with my leftover Fish Curry. 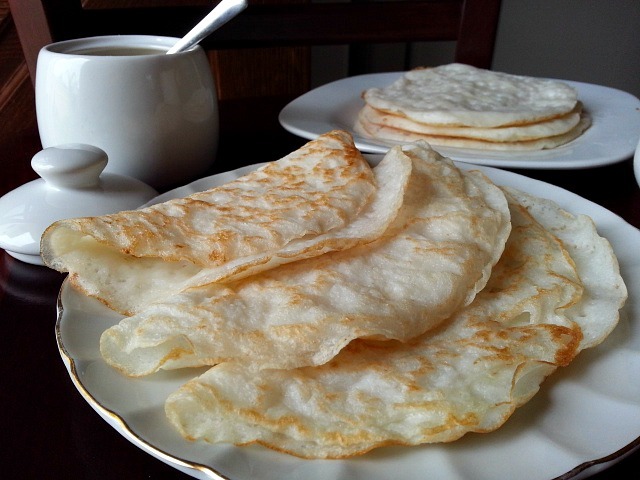 The pancakes are so airy and moist they absorb curries really well. In India overall breakfasts are savory than here in the US. And so I want to go back to my roots and have my kids start their day with a savory breakfast rather than cereals, pancakes and sweet breads. You will need a 1.5 days before you can make these pancake. Overnite to soak the rice and the following day to let the batter ferment and rise with yeast. In a grinder or mixer, grind to a paste soaked raw rice, cooked rice, coconut milk and water. 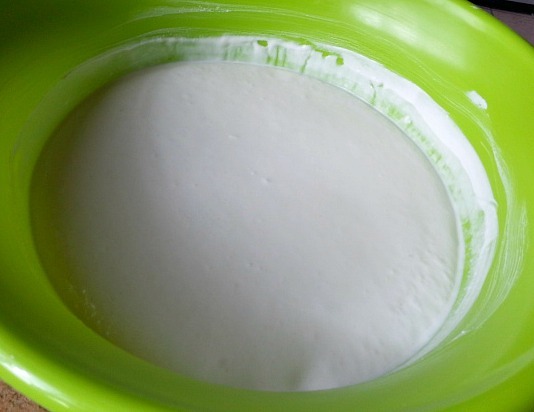 Add sugar, yeast to 3 tbsp of warm water and let stand for 5 minutes. Now mix both the above mixtures and let stand overnight till the batter rises and ferments. The mixture should be very similar to a pancake mixture. Not too thick. In a nonstick pan spoon some batter cover and cook for 3-4 minutes till done. Enjoy it with Curries or with Sweeten Milk. You can refrigerate the leftover batter for a day or two. If you are adventurous you can make alternative combinations. 1. Add chopped onion, tomatoes, green chilli and cilantro to the batter. 2. 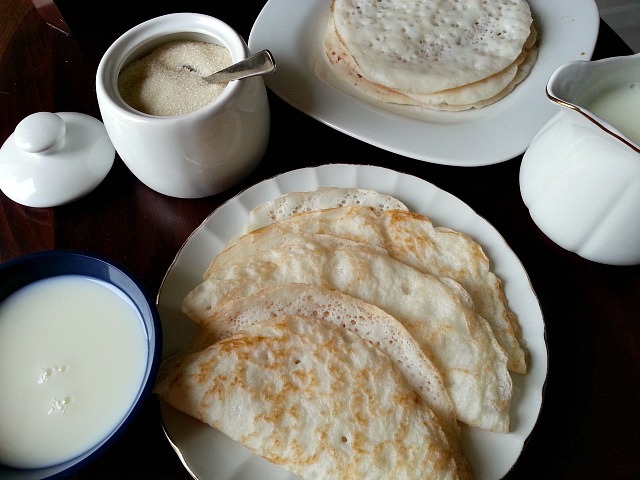 Once the pancakes are done shave some jaggery to make a sweet pancakes. I need to pin and try these! Can’t have right now frm. Cell hpe progame launch soon for all blogger to hve drooling share. These sound interesting, Nandini. I will need to try them some time. Good that they are gluten free too, so my wife can enjoy them as well.